Consumers, if you’re looking for a fuel-efficient small SUV that also has room for seven, you only have two choices in Best Small MPG SUVs with 3rd Row. Considering that compact means less space, that third row is going to be cramped, no getting around that. Still, these two models provide a fun and sporty driving experience, good fuel economy and that all-important 3rd row. Mitsubishi Outlander – Standout features of the compact crossover Mitsubishi Outlander SUV include seating for up to seven (with optional 3rd row), lengthy powertrain warranty (10 years/100,000 miles), sporty driving, and attractive base price (starting manufacturer’s suggested retail price of $20,840). Fuel economy is desirable as well, with an EPA-estimated 21 mpg city/27 mpg highway in the base 168-hp 2.4-liter inline 4-cylinder engine. Consumer Guide remarks: “Outlander is worth a look, but be sure to scout the competition as well. 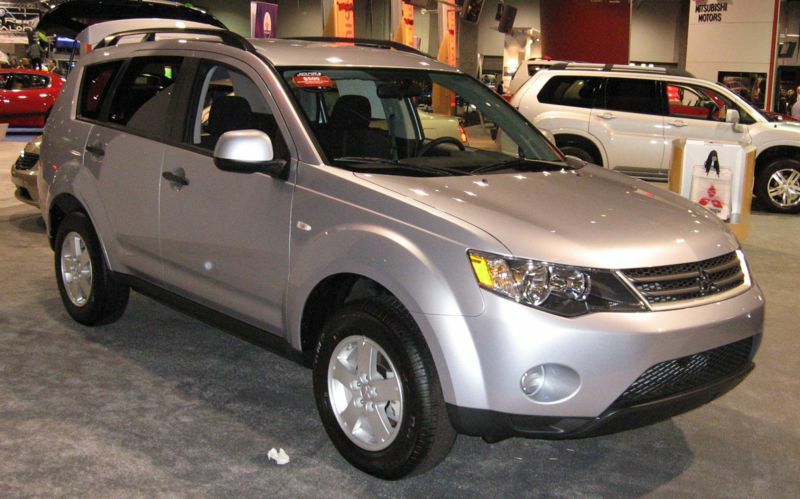 This crossover’s virtues include a responsive transmission and flexible cargo accommodations. Among its vices are a raucous engine, subpar interior materials, and the Mitsubishi brand’s record of weak resale values.” Bottom line: the 3rd row is for kids only, although it folds flat into the floor for convenient and ample cargo room, and fuel economy, while average for the segment, is great for a 7-passenger compact SUV – better than most minivans. Toyota RAV4 – Long considered the class leader in the compact SUV segment along with the Honda CR-V (which doesn’t offer a 3rd row), the Toyota RAV4 is also very fuel efficient. And, with the optional V6 engine, RAV4 delivers superb power. The base engine is a 179-hp 2.5-liter 4-cylinder that gets an EPA-estimated 22 mpg city/28 mpg highway in front-wheel drive (FWD). The optional V6 produces 269 horsepower and achieves EPA numbers of 19 mpg city/27 mpg highway (FWD). Both engines are also available in all-wheel drive (AWD), with predictably lower fuel economy – 21/27 (4-cylinder) and 19/26 (V6). Edmunds says; “Competition in the compact/midsize crossover category is tougher than ever, but the RAV4 remains one of the most appealing entries. We’d recommend opting for the V6 model if you can swing it, though, as its robust 265 horsepower achieves basically the same fuel economy as the four-cylinder model.” A big plus for the RAV4 is that the third row is comfortable and suitable for adults. Not only is the third row a rarity in the compact SUV category, space and comfort is even more rare. One more point worth mentioning: check with Toyota to see if RAV4 is being sold (due to the recent recall). Sales of Toyota models are resuming on a case-by-case basis.